I was in Rhode Island a couple of weeks ago to pick up a boat of mine that was being repaired, and I thought I would take a hike as long as I was up there. A friend recommended that I check out Weetamoo Woods, an open-space area of about 650 acres located just outside of Tiverton, Rhode Island, which was right near where I was heading. Located about 75 miles south of Boston, the location falls outside of the range of any of the Menasha Ridge Press hiking guidebooks. So I thought I would write the hike up for interested folks who might be in the area. It’s not far from Newport, Providence, or New Bedford, and it’s worth a visit for its natural and historical interest. 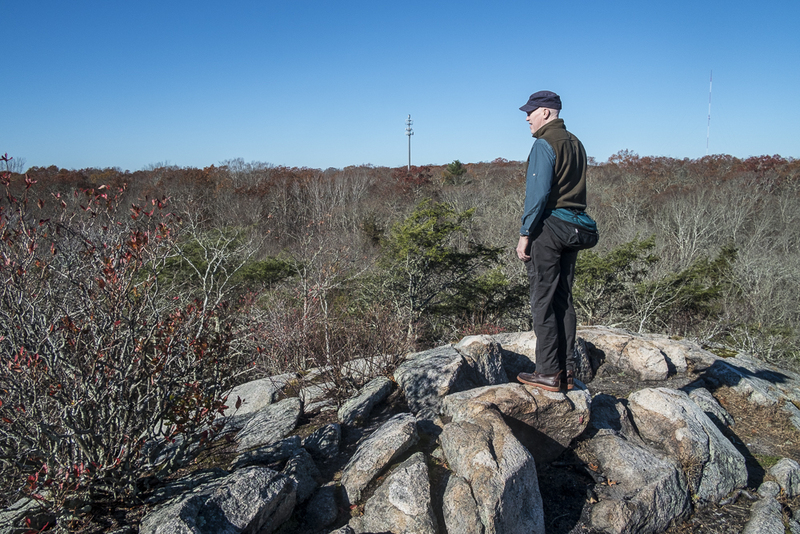 The hike makes a meandering trek along the network of trails through Weetamoo Woods, named for a female leader of the Wamponoag clan native to the Pocasset region, who died in 1676 during a battle in King Philips War. 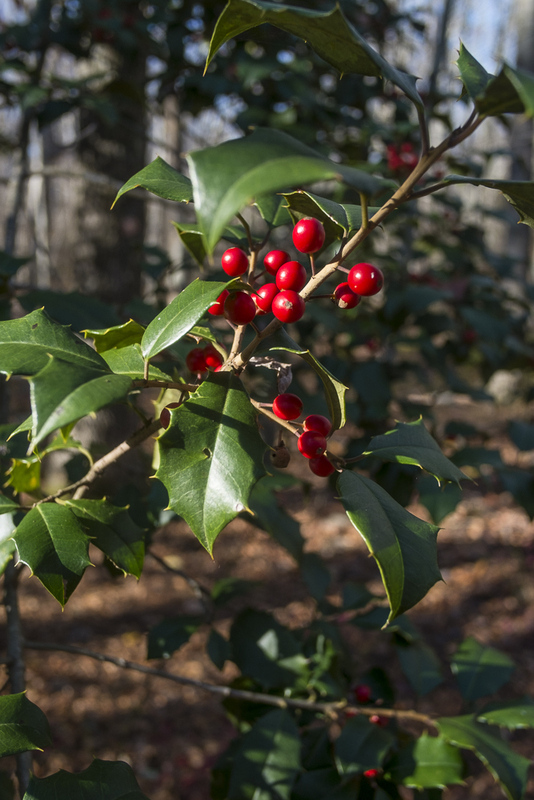 The forest here is comprised of a distinctive oak-holly forest, which is found rarely in coastal areas in southern New England. Along much of the hike, you’ll pass by holly trees that stand as tall as 20 feet or more (the tallest holly trees I have ever seen!) and some magnificent oaks. In addition to the oak and holly trees, you’ll encounter cedar trees, especially in the northern reaches of the woods, as well as birch and beech trees throughout. 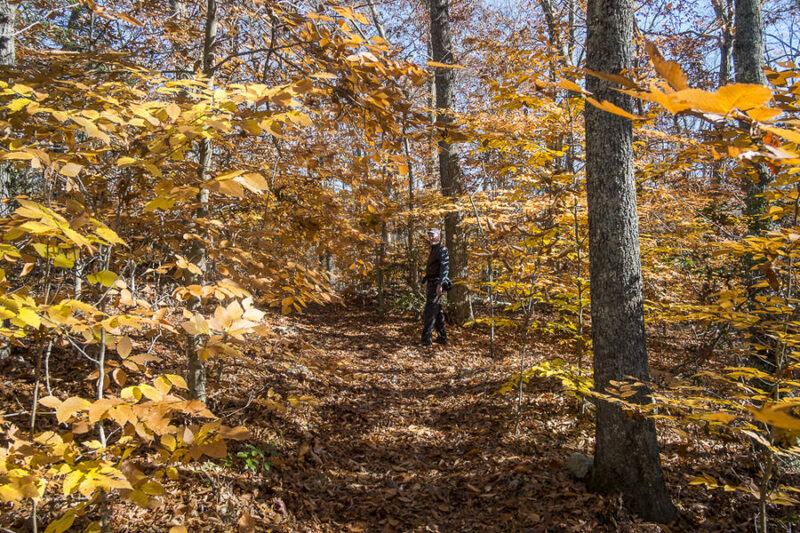 The trails in Weetamoo Woods are named for the color of the blazes that mark them—orange, yellow, blue, red, etc.—although some of the trails were not especially well marked in places. To the north, the hike passes into the adjacent Pardon Gray Reserve. There the trail names appear to be drawn from geographic features (Cemetery and Ridge being the two of importance to this outing). 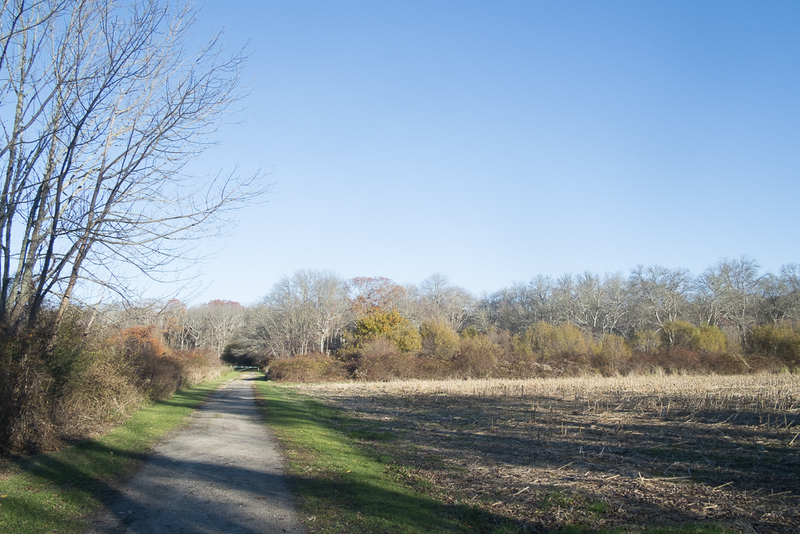 Begin hiking from the southern Weetamoo Woods parking lot, located on the north side of East Road, RI 179, about 0.6 miles east of RI 77 south of Tiverton (N41° 34.333′ W71° 10.637′). Follow the path north past the open field on the right to the prominent kiosk. It provides some information about the history of Weetamoo and the Wampanoag. At the kiosk, turn onto the Orange Trail and follow it along a narrow grassy path into the woods. For the next 0.4 miles you’ll pass several large holly trees before coming upon a rock outcrop on the right. The trail crosses a clearing for a gas line shortly beyond, and at approximately 1 mile into the hike passes the junction with the Blue Trail on the left. Continue on the Orange Trail for another 0.25 mile to its end at the Red Trail. Turn left and follow the Red Trail to the west for 0.4 mile to the foundation of an old saw mill at the crossing of Borden Brook, joining the Blue Trail just before the mill site. The mill was in operation during the mid-1800s. Given the size of the rocks forming the foundation, it must have been a significant enterprise. You’ll pick up the Blue Trail heading west from the mill site, though it can be a little difficult to locate just where to go. Follow an indistinct path up over the wall of the old mill just west of the brook. Once above the wall, the path is easy to follow and soon reaches High Rock. The Blue Trail actually passes beneath High Rock to the south. You can, and should, however, take the time to follow the side path to the top of High Rock, where you can get a very nice view of the surrounding country. After visiting High Rock, walk back down to the Blue Trail and follow it west for a short distance to the Yellow Trail in a sort of hollow. Turn right and follow the Yellow Trail north. After crossing a small footbridge, be alert for a sharp left turn in the Yellow Trail, about 100 yards beyond (2.2 miles). The Green Trail enters from the right and a side trail heads off straight. Turn left on the Yellow Trail, descending a short distance to a large oak tree where it bends back to the north. Continue north, passing an unmarked trail on the left (2.4 miles; leads to a dump). A second trail on the left, marked by a sign as South Trail (2.5 miles, heads to parking along RI 77); this is one of the Pardon Gray Preserve Trails. At a third trail on the left (2.8 miles), you can pick up both the Cemetery Trail and Ridge Trail. 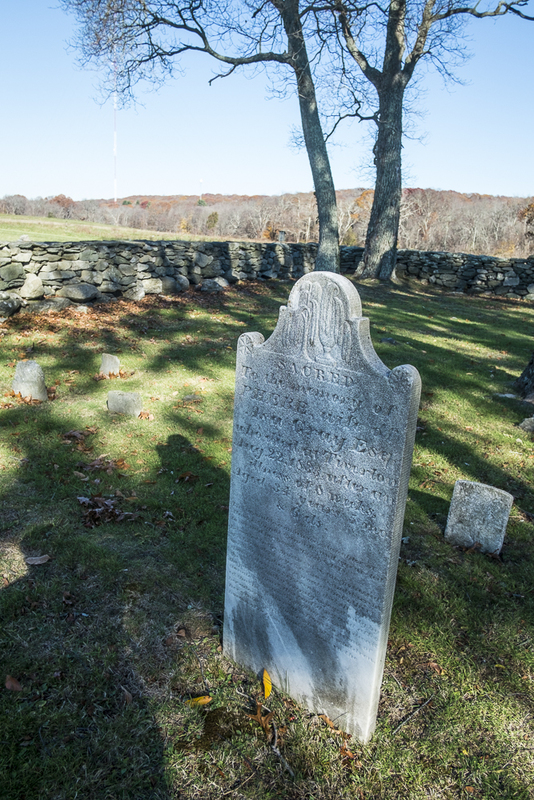 This tombstone at the Pardon Gray Cemetery dates to 1833. The walk out and back to the historic Pardon Gray Cemetery is about a mile long. It is worth the effort, both for the historical interest of the cemetery (it dates to the 18th century) as well as the nice view that the open field provides. After hiking out and back to the cemetery, Pick up the Ridge Trail and follow it north to the small parking area at Lafayette Road (0.4 mile from the junction with the Yellow Trail). Turn right on to Lafayette Road (pedestrian traffic only), walk past the gate, and follow the road for 0.25 mile to the junction with a significant forest road on the right. This is the northern end of the Yellow Trail, although blazes are hard to find here. Follow it south along the top of a gentle ridge and in 0.25 mile you’ll come to a junction with a spur trail entering from the left. Here you will find a yellow blaze. From this point, follow the Yellow Trail back to your car at the parking area (about 2 miles). 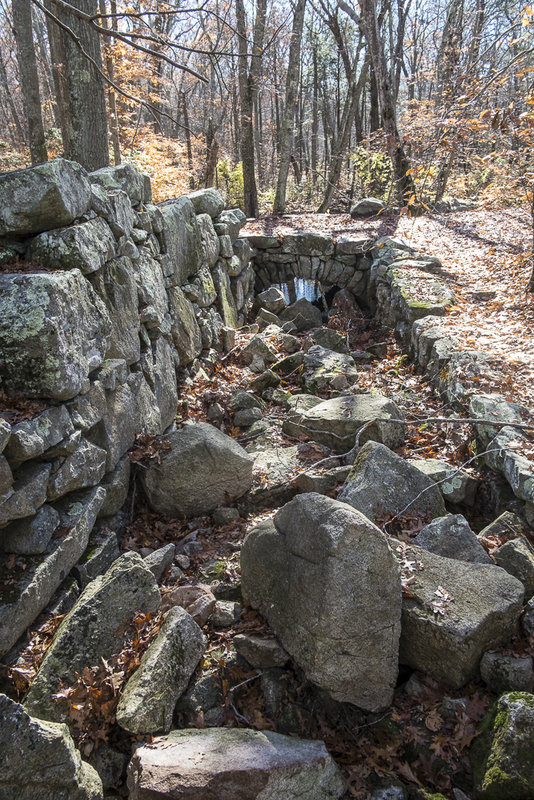 About 0.5 mile before the parking area, near a large open meadow on the left, you’ll cross an old stone slab bridge over Borden Brook that was likely constructed for access to the mill. The grassland meadow on the left is an established habitat for endangered birds. Matt got into outdoor exploration as an adolescent by making trips to New England with his family and friends. In the late 70s, he moved out west to ski and spend more time outdoors. He eventually earned a degree in outdoor education, and began working in the wilderness service program at the Armand Hammer United World College in New Mexico and for the Colorado Outward Bound School. As a traveler, Matt has sought out those unusual places that few people ever think about visiting. From the tip of South America to the remote northwest reaches of Iceland, from Newfoundland and Labrador to the Indian reservations in northern Arizona, he repeatedly goes off of the beaten path to see what surprises might be found in places that don’t show up on most peoples’ radars and what might be learned from the people who live in these places. He brings that same curiosity about places and people to his work close to home as well. In addition to have having written a dozen or so articles on various subject, he is author of The Best Tent Camping: PA and 60 Hikes within 60 Miles: Harrisburg, both of which have come out in second editions this year. His Best Hikes of the Appalachian Trail: Mid-Atlantic will be published by Menasha Ridge Press in time for the holidays. And he is currently working on a second edition to Best Tent Camping: New Jersey as well as a book of travel essays on the eastern shore of Nova Scotia.